Upheaval. Chaos. Fear. Survival. Words that describe life close to Ukraine’s eastern border with Russia over the past several months. Many of you have asked about our friends in Ukraine. “What about the orphan graduate ministry there? Are they okay? Are they in danger?” The good news is that the city of Dnipropetrovsk has not been the site of any military actions in all this. But if you think about it for a minute, we could use those same words to describe the lives of orphans as they “graduate” from their institutional homes. Upheaval. Chaos. Fear. Survival. Unfortunately, the word survival should be followed by a question mark. Many of them literally don’t survive. But there is good news on this front, too! More and more orphan graduates, young men and young women, are getting loving, personal help, guidance and training to help them navigate the extraordinary time of launching from institution to independence. And at the heart of everything the Alpha Life staff is doing is the love of Christ Jesus. 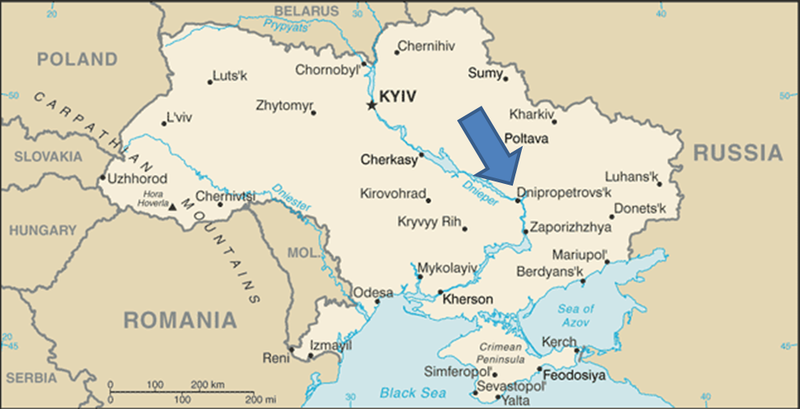 As you can see on the map, Dnipropetrovsk is not terribly far from the hot zones, but far enough to keep them out of the action. However, we can’t say they haven’t felt the impact. Many Ukrainians have fled their homes–some have been destroyed. Many have landed in Dnipropetrovsk looking for help. Our friends at Central Baptist Church of Dnipropetrovsk have been helping with food and warm clothing. Along with our Ukrainian friends at Alpha and Omega and Central Baptist Church in Dnipropetrovsk, we began developing this vision in 2012. Then we launched the Alpha Life ministry in 2013. Now, a year and a half later, we’re seeing the second school year of ministry bring exciting opportunities and growth. It started with one–Vadim. A wonderful young man who is now studying at a medical technical school. Many have followed Vadim! Zhenya works with the young women through Alpha Life. She is currently teaching and mentoring 3 young women who have already graduated out of orphanages: Sonya, Nastya and Tanya. They are studying logistics, electrical engineering and management, respectively. And there are 4 more young women who have visited the ministry several times so far. Please pray for these young women that are still “getting to know” the ministry and Zhenya. Pray that they will feel the love of Christ and be drawn to the “family” at Alpha Life. Alpha Life takes its name in part from the key partner ministry–Alpha & Omega (AO). AO is a great ministry for young adults that is based in a facility that is for all intents and purposes a community center. They also hold church services there on Sunday afternoons. Depending on when you walk through the doors, you can find any number of things going on: ping-pong tournaments, life skills classes, Bible studies, music lessons and more! Four young men are regularly attending Alpha Life lessons as well as activities at AO. Paul, Ruslan, Vlad and Victor. They are all studying at the same college to be electricians. Three more guys have attended a few events at AO and seem to be interested in getting connected to Alpha Life. Several of the guys have also been to the services at Central Baptist Church of Dnipropetrovsk. Andrew has been building relationships with them and has even started teaching guitar to a couple of guys! Andrew is Zhenya’s male counterpart in Alpha Life. Andrew joined the staff at the end of the summer. It’s great to have him on board to help mentor the young men. Not only is Andrew a musician, but he’s also an athlete. He just finished a career on the Ukraine National Track and Field team! In one of his updates about the young men Andrew mentioned that he was encouraged to see “their hearts warming” to him and the Alpha Life staff. We thank God for the reach Alpha Life is having already! In fact, Zhenya says they are working with 11 other orphans in 3 different orphanages who are set to graduate in 2015. Please pray with us that God will continue to warm the hearts of these young men and women as Viktor, Zhenya and Andrew share with them the love of Jesus.